It was 11 pm before my husband and I arrived in Paso Robles Sunday night. It had been 16 hours since we departed Topanga Canyon to start our return trip on our electric car adventure from Silicon Valley to Malibu. I was exhausted and ready to go to bed when we walked into the lobby of The Oaks Hotel outside of downtown. The last thing we needed was another challenge, but indeed, there was yet one more to come. Hours earlier, we fell short the 30 miles we needed to reach Paso Robles, and found ourselves charging at the Marsh Street parking garage in San Luis Obispo instead if eating dinner in Paso Robles. Luckily, San Luis Obispo is a hopping place, filled with vibrant cafes and what looked like very cool furniture and home design stores ( they were closed). There’s a movie theater near the charging station, which was free for charging. The garage charges parking fees but not after 6 pm so this was another free fueling, so to speak. 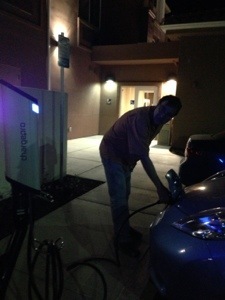 Sometimes, you feel a little homeless while wandering around waiting for the 2012 Nissan Leaf to charge. We ambled into the Barnes & Noble and grabbed an outlet in the magazine section to charge our phones. This is a college town, home to Cal Poly and no one blinked an eye. At dinner the waiter chatted with us for so long about energy politics and EV driving I was sure his manager would soon nudge him along. It was great talking with him. He drives a hybrid Honda Insight and would like a Chevy Volt, but finds it too expensive. He happily took my husband ‘s phone and plugged it in behind the counter to finish the charge as we ate. We chose The Oaks Hotel because it has a charging station. We reserved a room in advance and were assured we could charge the Leaf for free. It was lucky we did because the lobby was filled with a rocking wedding party when we arrived and the parking lot was nearly full. We checked in and drove around back to hook up to one of the five chargers that beckoned us with their glowing blue lights. A Tesla was hooked up to one, but the other four ChargePro chargers were free. So far, so good. Then, my husband plugged in the charger to the nose of our Leaf, but nothing happened. The display panel on the charger prompted him to wave his card. This is not unusual. Whenever he uses a Blink or ChargePoint charger he waves his fob or RFID card before the charging can begin. If there is a fee for the electricity, his account is automatically charged. When he first started driving the Leaf, he did not know this and so he sometimes had to call the 1-800 number on the charger to get it turned on. Once, a kind fellow EV driver let him use his card. But by now, my husband had all the necessary cards and accounts until now at 11 p. m. at night. While he stayed at the car I went back in to fetch a card from the front desk. The woman on duty starting rifling through drawers to find one. The chargers are brand new, she explained, replacing the single charger that had been there. She dialed the phone a couple times , but got no answer, and then looked through some more drawers. I did my best to maintain a calm facade as the wedding guests partied on, and the clerk failed to produce the magic card. These were the only public chargers in town and our Nissan meter said we had only 15 miles of remaining charge. Then, the owner arrived with a kind smile. Philip Tusi walked out to meet up with my husband. As they tackled the problem, I retreated upstairs to a large, comfortable, sparkling clean room with a king bed, fluffy robes and complimentary slippers and water. Ahhh! It turned out that we were the first EV drivers to use this newly installed SemaConnect Charger and the hotel owners had yet to set up the account. The owner, reassuring and determined, had to track down his wife to get her credit card to sign up for the account. More than 30 minutes later, the Leaf was charging again. The owner also gave us a card which apparently allows us to sign up ourselves, but it is still unclear whether guests will need to do that. There is still some confusion about EV charging among the staff. That became clear when one of them told me that these were the only EV chargers between San Francisco and Los Angeles. I assured her that having spent now five days on the road to Malibu and back that this was not true. This is an upscale hotel with lots of amenities such as a pool and a full breakfast included and we paid more than we would have liked fir a quck overnight stay -$188- because it has a charger station. It is not in the quaint downtown area, where we would have preferred to stay but there are no charging locations there. Despite the inconvenience, it was easy to forgive the kind and forward- looking EV pioneers at The Oaks Hotel who have decided that charging the cars of their customers is good for business. And climbing into that king bed overwhelmed with soft, comfy pillows never felt so good. 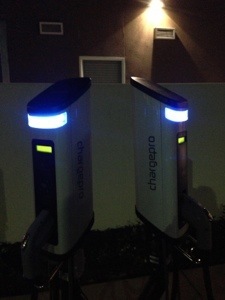 Nice to hear Paso finally has a public charger, albeit at a hotel. Until now, only Jeremy was on Plugshare in that town! Indeed, it is a good start. The folks running the hotel could not be nicer.